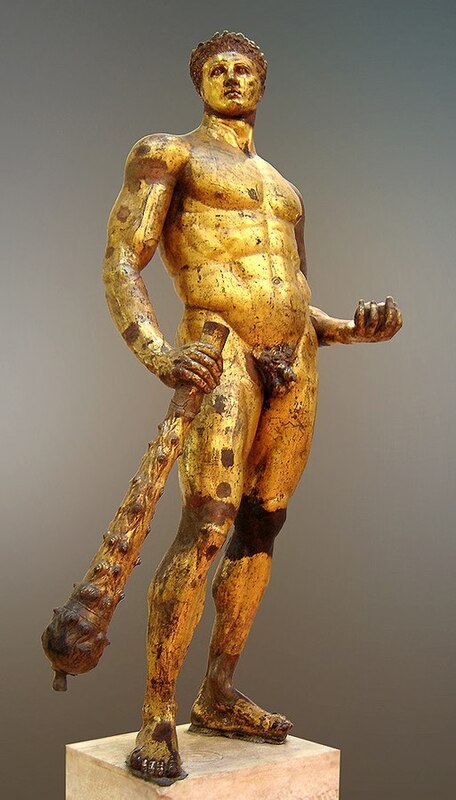 Known in Roman Mythology as Hercules, and in Phoenician/Carthaginian mythology as Melkarth. Theban Greek hero and demi-god; son of Zeus and the mortal Alcmena, whom Zeus seduced by taking the form of her husband, Amphitryon. The mightiest and most famous of the heroes of Greek mythology, comparable to the Hebrew Samson and the Hindu Indra and Arjuna, Hercules is credited for founding the Olympic games. He was considered a saint by the Stoics for his example of obtaining ultimate deification through enduring the ordeals of the world. His symbols are the two pillars, the club, the apple, the cornucopia and the lion’s skin. Because he was hated by the jealous Hêra, wife of Zeus, the life of Hêraclês was fraught with ordeals, over which his tremendous strength generally enabled him to prevail. Hêra began to persecute her namesake even before his first breath. She delayed his birth, and sent two serpents to kill him while he was just a babe in the cradle; but he seized them in his tiny (but powerful) hands and strangled them. In a fit of insanity caused by Hêra, Hêraclês slayed his own wife and children. In atonement for this atrocity, he offered himself as a slave to Eurystheus, King of Mycenae. Eurystheus enjoined Hêraclês to accomplish the famous Twelve Labors (comparable to the twelve labors of the Sumerian Gilgamesh), for which he was outfitted by the various gods of Olympus. The twelve labors were: killing the Nemean lion (which could not be killed by stone or metal, and whose skin he wore thenceforward); killing the Lernean Hydra, which grew two new heads for each head it lost; capturing the golden-horned Cerynean stag; capturing the Erymanthean boar; cleaning the Augean stables; killing the deadly, iron-feathered Stymphalean birds; capturing the man-eating mares of Diomedes; capturing the Cretan bull; obtaining the girdle of Hippolyta, queen of the Amazons; stealing the oxen of Geryon (during which exploit the Pillars of Hêraclês were created); obtaining three golden apples from the garden of the Hesperides (the most difficult of the labors); and bringing Cerberus to Earth from the Underworld (the most dangerous of the labors). After completing the Twelve Labors, Hêraclês obtained his freedom from Eurystheus and married Deianeira, daughter of Dionysus and Althaea. One day, while travelling, Hêraclês and Deianeira came to a river where the centaur Nessus was carrying people across for a fee. Hêraclês crossed on his own, leaving Deianeira for Nessus to carry after him. When Hêraclês had crossed, he looked back and saw that Nessus had run away with his wife. He gave chase, and shot Nessus with an arrow. The dying centaur told Deianeira to take his blood-stained shirt as a charm to preserve her husband’s love for her. Eventually, Deianeira began to doubt her husband’s devotion and decided to present him with the shirt. When Hêraclês put on the shirt, the residues of the blood of Nessus permeated his body and burned him like acid. He tore at the garment in a vain effort to relieve his agony, but it held fast to his skin, causing him to tear his own flesh to shreds. Mortally wounded, he ascended Mount Aetna and built himself a funeral pyre, laid himself upon it, and commanded his friends to set it on fire. The gods were troubled by the demise of one of their favorites, but Zeus encouraged them by explaining that Hêraclês was half divine, and only the human side of him could die. The divine half of Hêraclês was taken up to Olympus, and Hêra, now reconciled with him, gave him her daughter Hebe in marriage. This saint was italicized in the 1929/30 e.v. version of the list, but not in the 1918 e.v. version.